Very popular due to its size/weight/power ratio. Pretty quiet compared to others as well. Using powerful iron really helps and you dont have to remove the cover to solder on the wires. You need to modify it by cutting two of the traces and place a resistor on one of them. Firstly, drill carefully out the pop rivets to gain access to the insides. Slide out the board and flip it over. First trace(marked with red cross) is for over-voltage protection. If you do not cut it, the PSU will shut down when voltage goes above 57.5-57.6V. If your fully charge voltage do not exceed the 57.5V you don't need to cut it. Second trace controls the DC Voltage. It goes directly to the second control board. Same here, you need to cut it and solder on a resistor. Here is a 1,5 kOhm that makes 58.4 on the DC tabs. Or you can add potentiometer to adjust the voltage gradually. Last edited by Allex on Apr 22 2016 3:02pm, edited 5 times in total. It is possible to re-program Eaton so you can have lower voltage and lower amps, this is perfect if you have 14s battery with Adaptto system. Or you want to bulk charge to your preferrable voltage during a simple bulk charge. Install driver and solder on the wires, connect USB programmer to eaton and plug in programmer to your computer. DO NOT plug in you Eaton to wall socket! Once Windows recognize USB Programmer, open up Khazama AVR programmer. During write LEDs will turn of on the Eaton. Last edited by Allex on Apr 16 2016 2:28pm, edited 3 times in total. Allex, can you tell me how you open the APR 48 case? It has all these screws or what looks like rivets. How do you unloosen them? Also, in your wiring diagram you have only 2 wires for AC in. For 110 volts we have positive, neutral, and ground. Do you know which ones go where for a 3 wire setup? Yup, those are pop rivets! Eaton deff. don't want us to dig inside. So you need to drill out hem to access the guts. But if its just a soldering job on the main leads then you don't need to open it, there is enough room to solder with the top case on. In the last picture in the first post(the one with multimeter) you will see the correct wiring if you want to use the ground as well. most important question: WHERE to buy them, and HOW MUCH? can i install 2x Eaton PSU to a max-e with a 70A coil and have 2 x21A charging current? The only 21A is not fast for my 16P Sony VTC5 with about 41,60Ah. Today I charge with my Siemens charger with about 50,40V and 45A, so around 2250W. 2 x 1650W like your single PSW are welcome! Do you have 2 pcs. PSU on stock? Eaton can actually deliver more Amps. In the pciture the limitation to 21A was du to my higher voltage. So if your pack voltage are lower than 20s it will pump in more. I heard that you can use those in parallel as long as the output voltage is the same, for a total of 3,6kW. My friend is currently in China and will bring 3-5 units for me. Allex wrote: Eaton can actually deliver more Amps. In the pciture the limitation to 21A was du to my higher voltage. Allex, this is clear, so how many max Amps are possible with one unit. Please send the max. Input (PSU)and output Amps (for charging). Thanks for your helping hand. -can your Eaton also handel more then the 1800W? ecross, I dont know more than the datasheet, perhaps it can help you, in the first post. I never experimented with more than ~1800Watts. Allex wrote: ecross, I dont know more than the datasheet, perhaps it can help you, in the first post. I never experimented with more than ~1800Watts. Allex: Could you please set the PSU with the max output and show us your measurents? Maybe current users of this PSU could help you out, probably best to ask in adaptto thread. question: is it normal that the orange led always flashes during (normal) operation and if the psu is fully loaded it stays on constant? 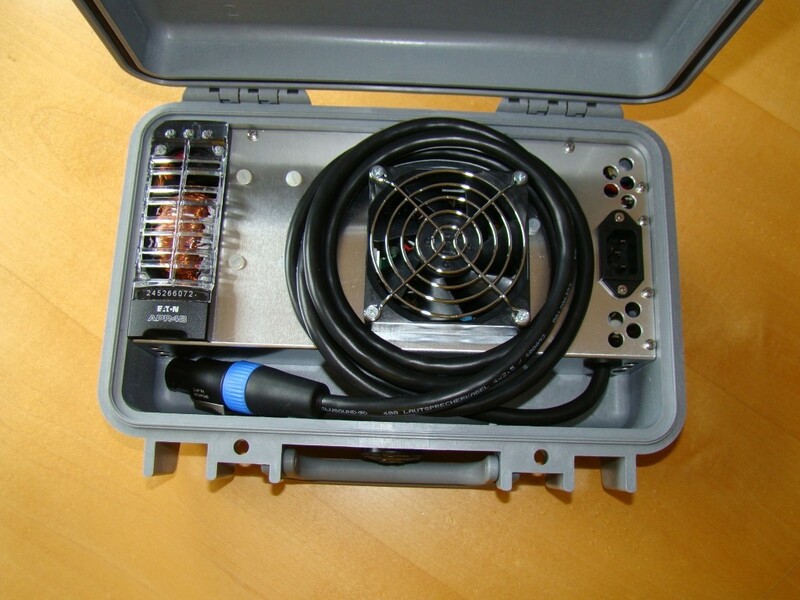 i ask because i have done some work on it to get it fit in peli 1170 case (yes, together with the small coil) and i have not tested it before so i have no comparsion. i have never seen more than 1730W on the Adaptto display at full load, but i guess thats normal because the missing 70W are the losses from step up conversion. this is probabaly the amaount of power which turns into heat in the coil and controller. my Eaton is factory set to 54,4V (like everyone should be). with 2V vdrop setting and 30,5A supply current i can pump constant 1600W power into my battery without to have full stress on the psu. thats awesome compared to the heavy and bulky chargers i used before. the conversion into peli case required some heavy thinking, but the great result was definitely worth all the time i have spent with it. Show us pictures of you case! That orange flash is normal yes. Adaptto can show up to around 1700W, of course you will loose a few on the way there. Allex wrote: Adaptto can show up to around 1700W, of course you will loose a few on the way there. i wonder if it would make sense to set the voltage to about 58V by doing the mods you posted in another thread. with higher volts we could turn down supply amps a bit which should improve efficiency. im going to post pics soon, but first i want to paint the aluminum cover and mount it again on the supply. probably (if i have enough time) i will make lots of detailed descriptions and list up all kind of materials i used so other can convert it too. The mods are here in this thread. And yes the charging should be more efficent by upping the voltage. this is my Eaton built into peli 1170 case with the small coil. The Fan is super silent compared to the stock little screamers and since the aluminum cover is attached to the heatsinks it also stays very cool! will make a thread about it when i have more time..
Wow, beautiful as always Madin. nicely done! Looking forward to the build thread! 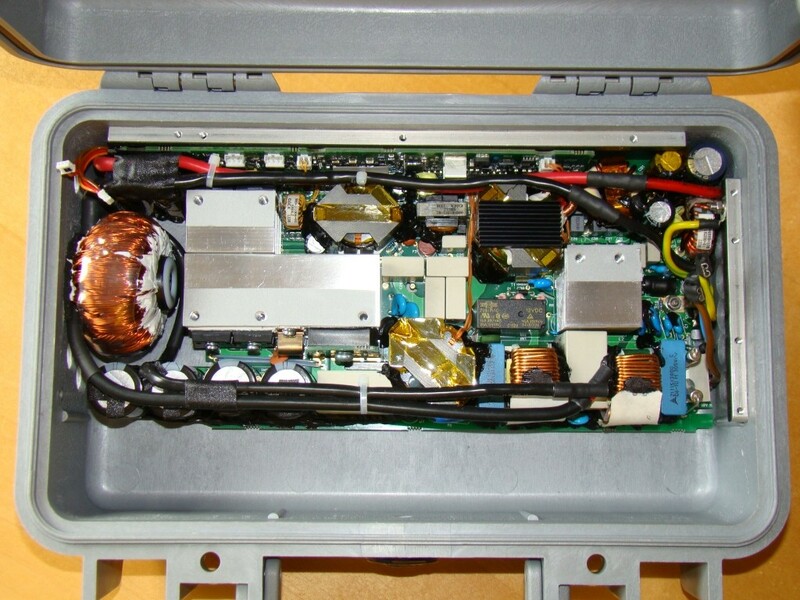 a nominal 48v. The battery seller recommends cv/cc, would you say this PS is so. I saw your earlier post on the mod to a higher volt and that I can do. Could I expect to get a 20 or so amp charge (@110v)? Could you explain the coil a bit? I was just going to bulk charge but, I do own a 30 amp coil I got for whatever options . Just seems simpler to bulk charge the batteries to me. Darned If I can figure the hows or whys of that coil. Hi, do you have Adaptto setup? If no just bulk charge, if yes, it is neat to charge via controller, you will see how much time is left to a fully charged battery, cell status and so on. madin88 wrote: will make a thread about it when i have more time..
Alex, in the stats, was listed as 43 to 57.5. is there an adjustment or is that only after the mod ?